Thank you for choosing to participate in the WJGA. We are looking forward to meeting our new junior members and to see our returning players and their families again this summer. Casey and Brady McMullin – District Two Directors! 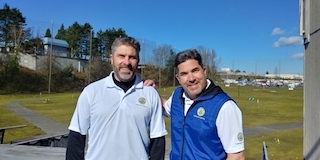 We are excited that WJGA offers a great selection of courses each year and are happy to be at each event in our role as Tournament Director to help facilitate the ins and outs of a competitive golf tournament for the kids and parents. Please make sure to check out the complete WJGA Schedule and sign up for all events right away. Our field sizes are limited and so the policy is “first come first served”. (or one event if player enters only one event). Players may be asked to withdraw if no walking scorer is provided. Tee times will be posted on the District 2 Tee Times page of the WJGA website at least 48 hours prior to the event. Pairings cannot be changed once the tee times are posted. Pairings cannot be requested. Please don’t ask to be paired with your friends. All players should arrive at the course and check-in AT LEAST 30 minutes prior to their posted tee time. All players in the 12-18 age divisions play 18 holes, while players age 8-11 play 9 holes. See my District tournament schedule here.